The wisdom of Ian Malcom’s chaos theory ought to have inspired more heeded warnings in the “Jurassic Park” films, but sometimes tragedies are doomed to enter vicious cycles before higher influences catch on. In Steven Spielberg’s first of these outings, those words served as foreshadowing in a premise where man’s gift of scientific advancement became the tool for which he could recreate the dinosaurs from extinction, essentially for monetary gain. When a pair of paleontologists (and some skeptical investors) were then offered a chance to see those endeavors in a new theme park on a remote island in the Atlantic, it became the launch point for an elaborate nightmare of chases, accidents and skillful animatronics. It all began when security grids were compromised during a bad storm. Then electrical fences went down. Dinosaurs escaped their compounds. And at the height of it all, the eager visitors were all thrust into a situation where they had to act – and often quickly – in order to maintain their survival, if for no other reason than to ensure continuity for additional chapters. Twenty-something years have passed since the first of three adventures have transpired on a pair of dinosaur-infested islands, and now comes “Jurassic World,” the fourth entry, which returns us to the site of the first picture after a renewed attempt at a park has culminated in a very successful tourist attraction, now open to the public. But is there anything left to say about the underlying issue that hasn’t already been argued? That, I suspect, depends on who you ask. Filmmakers like Spielberg believed the next step for a concept like this was to expand on what we were seeing with more adventurous (though less wondrous) special effects, all while treating the material as lightweight adventure (not a problem, mind you). Colin Trevorrow, who presides over the direction of this newest picture, is all about taking baseline ideas to more expansive levels. His movie isn’t so much a direct follow-up to Spielberg’s original as it is a modern retelling, essentially replicating the formula down to dubious specifics while undercutting the conventions with an intriguing mix of humor and cynicism. A great many moves are handicapped by shifting tones. Fewer others destroy momentum by alternating between them with schizophrenic intentions. But “Jurassic World” is, if nothing else, a very self-aware blockbuster that uses its core values for a greater good, which is to deliver a lightweight story in the skin of a very skillful science fiction creature feature, where the action scenes permeate energy, the actors hold their own in a journey destined to send them into the backdrop, and the narrative flows without all the hiccups that tend to come with clichéd destinations. So many years after the last entry into this volatile series, it is a wonder any filmmaker could muster up the energy to bother. To see it is to bask in the purity of a simple sense of enjoyment that seems lost behind the pomp and circumstance of the Hollywood money machine. Even the very setup recalls the innocent nature of classic B pictures. In the opening scenes, we meet two brothers – teenage Lowery (Jake Johnson) and young Zach (Nick Robinson) – who are sent off by their parents to spend time with their aunt, who just happens to work at Jurassic World. She is played by Bryce Dallas Howard, in a role where ordinary human traits are buried behind the corporate façade she has worked into her routine. There is scarcely a moment that she exists where she isn’t glued to her phone or reciting company rhetoric, exemplified further by a scene when she greets her nephews and then pushes them into the custody of her assistant for the duration of their stay. Few call attention to her controlling nature, but a handler named Owen (Chris Pratt) has that streak of bravery because, well, he witnessed it all first-hand in a very bad date they shared. The added significant of this moment in time – a reported 20 years into a successful tenure as a fully operational theme park – is that Jurassic World’s financial stability is in question because of an erosion in attendance. After two decades worth of new attractions with varying spikes in public interest, the company funding the genetics division is seeking something new and exciting to promote. Their answer: a new dinosaur that is actually a hybrid between multiple DNA strands, several of which are purposely never revealed. Known as the “Indominous Rex,” this new creature is isolated behind towering walls in a remote location on the island, where Owen – who has successfully developed a bond of respect with a group of velociraptors – is asked to come and assess it for possible integration into the park. Unfortunately, so many alternating strands of DNA have made this a very formidable beast with unprecedented skill, and when he and a couple of park hands wander into the cage to investigate its apparent disappearance, a chain reaction of chaos ensues. 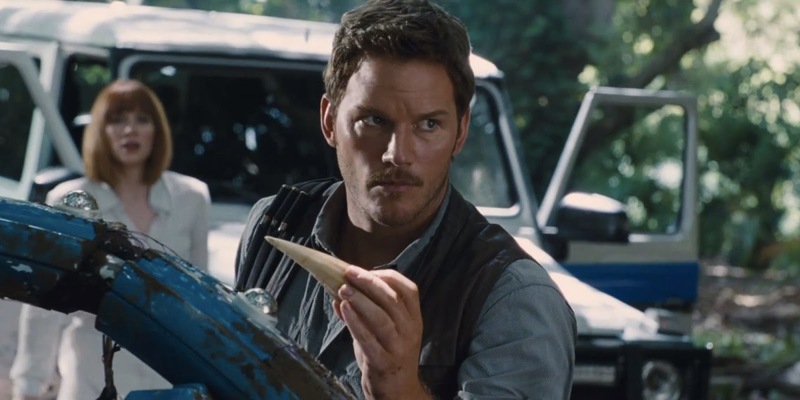 Deeper plot descriptions are irrelevant, because what all four “Jurassic” films have been are a succession of setups that are used to inspire heated confrontations between dinosaurs and humans, many of whom have to think quickly – and with a little skill in science – to thwart the bloodthirsty menace that surrounds them. The only thing that has changed is the quality of the creatures. Many will be enamored with the intricacy of the new Indominous Rex, but the best of the new ones comes in the form of a very large aquatic dinosaur, which is seen in a spectacular sequence early on bursting to the surface in order to feast on the carcass of a whole shark in just one bite. Other sights offer glimpses into the virtues of technology (the gyrosphere sequence, featuring a round bubble wandering amongst other dinosaurs in an open field, is very wondrous), and some of the more simpler ones are used to setup eerie foreshadowing (Owen’s encounters with his velociraptors, for example, are used to propel a subplot where the corporation hopes to use them for military purposes). The constant in all of this, however, is that each piece of the puzzle is written from the perspective of a textbook action picture. Of course the plot will require all of these circumstances to happen while two unprepared kids are loose in the wilderness. Of course one of the others (in this case, a minor player in the control room) will forecast the chaos by reminding everyone that they are playing with a fire they don’t know how to extinguish. Of course there will be a token figurehead aloof to danger, a scientist who has a god complex, a structured sort who must let down her guard to protect others, an arrogant overseer who wants to use the creations for something menacing, and a person who empathizes with the creatures as something more than just elaborate genetic mutations. And of course they will all come together in an elaborate series of climactic twists in which the survivors must use other dinosaurs against the biggest of their threats, especially as they all converge in a spot normally used as the epicenter of visitor gathering. Nothing about the movie is original. Every frame, every action and every twist plays like a recreation rather than an inspired exercise, and the film’s plot lumbers along leisurely as if its screenplay had been run through a carbon copy machine, where only names have been changed to fool those less familiar with the original. And yet considering all these conventional uses of details, the movie is a very amusing watch. Much of the action is photographed with striking clarity, the characters exchange banter that effectively balances each of the most critical talking points, and the climax is a very effective example of how a focused director can add a plethora of thrilling sensations to a single action sequence, regardless of how transparent the motives may seem. At the height of its possibility, the “Jurassic” films have not been deep considerations of their ideas as much as they have been well made B-movies, in which the folly of man is basically a concept to get an intense adventure going. If we are to make comparisons, this adventure is a lot more complete and effective than either of the last two (even with the modest affection I have for part three, mind you). This is a movie that accomplishes all it sets out to do, and takes the audience on a fairly engrossing journey into the heart of a reality where no one thinks about the consequences of lofty actions, even when they are being pointed out by lowly sorts who seem more perceptive than they should be.